Julianne Moore’s latest film Still Alice premiered in Toronto in September with little hype and emerged as one of the biggest hits of the festival thanks to her powerful performance. The role earned her a Golden Globe Award and now an Oscar for Best Actress. Moore plays a Columbia professor diagnosed with early onset Alzheimer’s disease in the new movie, which is based on Lisa Genova’s 2007 novel by the same name. The movie profiles a renowned linguistics professor struggling with the symptoms of Alzheimer’s disease–a real-life scenario playing itself out millions of times around the world every year. 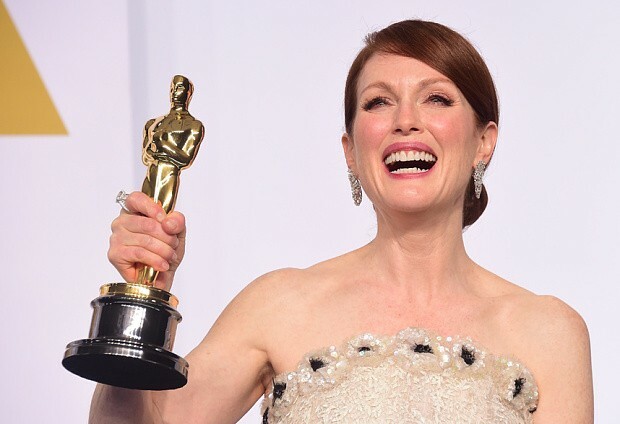 Moore has already netted multiple awards for Still Alice including Best Actress at the Gotham and Hollywood Film Awards, the Golden Globes and the Academy Awards for her work in Still Alice. I caught this film back at the Toronto International Film Festival, and it totally floored me. I don’t think I’ve cried that much in my entire life, let alone in two hours. “Oh, thanks for that. That’s one of the things about this movie is how touched people are by it, and I do feel like it’s genuine. It’s not forced in terms of peoples’ reactions. It’s not like the movie is trying to make you cry, it’s just people really connect to it. Which is nice,” said Moore. I’m sure you’ve encountered people who know or have known people with Alzheimer’s disease. What’s that been like to hear real stories and how the film touched those people? Do you know anyone personally who suffered with Alzheimer’s in your life? I don’t know anyone impacted by Alzheimer’s disease, yet. I’m really, really very lucky — that hasn’t been something that’s affected my family. One of the film’s two directors, Richard [Glatzer] has ALS. And I’m curious what that lent to your process — to work with somebody who’s going through that struggle every day, who went through that struggle on set with you. How did you approach portraying the scope of the disease in such a compressed amount of time? It was completely dependent on the amount of research I did. I couldn’t have done this movie — there was no way I was going to be able to figure out what to do with this movie — unless I’d had the proper amount of time to do research. Thankfully, I worked on it for about four months. I started research while I was doing [“The Hunger Games”] “Mockingjay.” I started watching every doc I could get my hands on. Every film, every documentary, every interview. So, there, once I got back to the city, I started with the head of the national Alzheimer’s Association, Elizabeth Gelfand Stearns, to talk about her experiences. And then they set up these Skype calls with three women across the country — all who had been diagnosed with early onset, or what they call “younger onset,” which means before the age of 65. And the youngest person I spoke to was a woman named Sandy Oltz, who was diagnosed at 45, which was was astonishing. From there, I went to Mount Sinai and spoke to Dr. Mary Sano, who is head the Alzheimer’s research there — and some of the other researches and clinicians. And I had a neuropsychiatrist administer the cognitive tests, which are extensive and shockingly difficult [laughs]. Then I went to the New York Alzheimer’s Association and met with the support group there, and spoke to the women in the groups about their feelings and experiences. And then from there, went to a long-term care facility and met people who were really pretty declined. So it was four months. How did you map out Alice’s gradual loss of memory? It’s so expertly modulated in the film, but that must have posed such a huge challenge for you. Thank you, it did! As I was saying before, if I hadn’t done the research — not that I understand what it’s like to have Alzheimer’s, anything I had any question about, I asked. I wouldn’t do any behavior I hadn’t witnessed. There would be times Rich, and Wash and I were talking about something. I remember there was something in the movie where I’d be looking and something and think, “I don’t understand that behavior. I don’t know what I’m looking at.” And we came up with the thing about tying her shoe, working really hard to tie her shoe. And I did see people working very hard to complete actions that seemed to be simple actions. So, it was always about that. Trying to be really specific, and just think about what I wanted to do in each scene. I went to the script a gazillion times, so that when we were shooting it, there was no question about what I would be doing. So I just kind of kept in my head that way.